Prodejné od 18 let !! This is the Fuku Ryu Katana which is part of our Go-Kening class. Forged of T10 tool steel and differential hardened the blade has a Rockwell Hardness of 60 and the back comes with 40 HRC. The blade is sharply polished and has a Bo Hi. 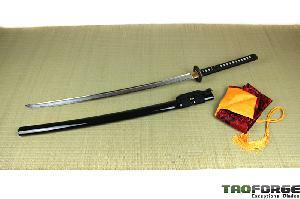 The tsuka ito is made from black silk and features real rayskin underneath it. A "Fuku Ryu" is to be seen on the tsuba, a dragon which is know as the lucky dragon in japanese mythology. The menuki also display a dragon, and also the Fuchi and Kashira show the same motif. The Saya is just simply black glossy and features a silk sageo. The blade of the katana has a very nice hamon pattern which is rounded off by the Chu Kissaki.